The following sections provide step-by-step instructions how to configure and administer the Out’n About! for Outlook system. The Out’n About! 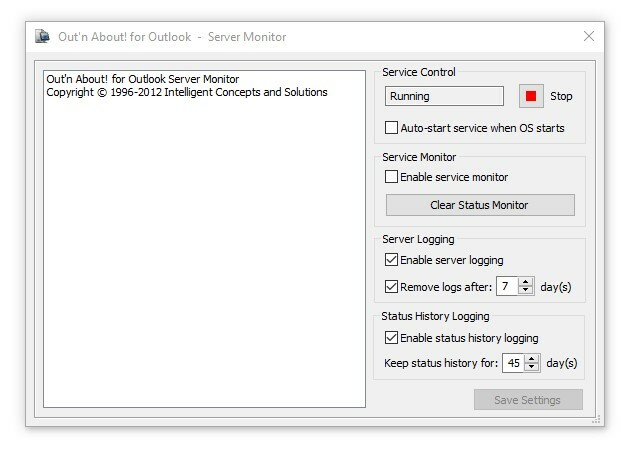 for Outlook Server Monitor is provided to allow easy configuration and administration of the Out’n About! for Outlook service. Upon completing the installation, the server monitor application is added to the system tray to allow quick access. Double click on the server monitor icon to the view the server monitor. You can also right click on the server monitor icon to quickly perform Out’n About! for Outlook server commands. Note: The Out’n About! for Outlook Server Monitor program can only run on the same computer as the Out’n About! for Outlook server since it connects to the locally installed service. The Service Control group allows you to control the Out’n About! for Outlook Service (server). Using the Service Control group you can view the current service status, start or stop the service, and configure the service to auto-start when the operating system starts. It is recommended that the service is set to auto-start so you do not have to manually start the service each time the machine is restarted. The Service Monitor allows you to monitor what operations the server is currently performing. All user operations that require the server are displayed in the service monitor window when this option is enabled. This feature is useful for troubleshooting or diagnosing connectivity issues. The Server Logging group allows you to capture all connections and operations performed on the server. The log files are stored for as many days as you configure and are stored in the program directory in the logs folder. The log files are comma delimited to allow import into external programs like Excel or a database. The Status History Logging group allows you to capture all status changes performed by the Out’n About! users. These log entries are used to create both Status History and Time Card reports using the client software. The status history entries are stored for as many days as you configure and are stored in the OutAbout.wdh database file. If you purchase a server site license (unlimited user) you must enter the company name and registration code provided in the activation e-mail you received when you purchased the license. If you did not enter the registration code during the install process, you can register the software using the server monitor. Enter your registration name and code exactly as provided by Intelligent Concepts and Solutions.